Home Photography Photoshop vs GIMP: Which Image Editor is Better? No one doubt about the popularity of Photoshop. This tool is widely used by professional photographers around the world. Photoshop is not only popular in the photographers community, but also designers and those working in the creative industry in general. Price is still the major problem for those who want to use Photoshop. Especially those who haven’t capable yet to earn money from photography and design. GIMP is the best option if you can’t afford Photoshop. It is considered as the best free alternative to Photoshop. Functionally, GIMP is not much different to Photoshop. You can also use GIMP as a photo retouching tool, graphic design tool, image editing tool and so on according to your speciality. In some ways, GIMP is even better than Photoshop. For instance, GIMP consumes less system resources when working. Quick question, which is the better between Photoshop and GIMP? Let’s figure it out. Be it Photoshop or GIMP is a cross-platform tool. Both are not designed specifically for a certain platform. 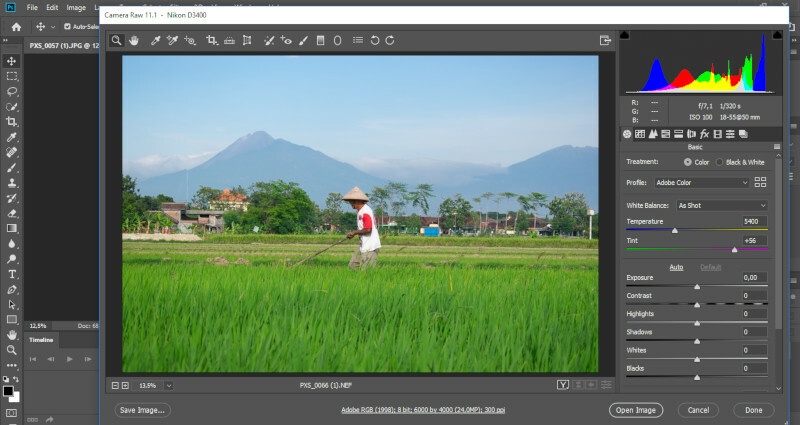 GIMP is an open source image editing tool, but it is not design specifically for Linux. GIMP is available for Linux, Windows and Mac. So is Photoshop. This tool is also available for several platforms. For the desktop platform, Photoshop is available for Windows and Mac while for the mobile platform Photoshop is available for Android and iOS. The mobile version of Photoshop is called Photoshop Express. Photoshop is not available for Linux. Conversely, GIMP is has no mobile version. The era has changed now. More people are using their smartphones to edit photos. With Photoshop Express you can edit your photos while on the go, without having to depend on your PC although the features and capabilities offered by Photoshop Express are not as complex as the regular Photoshop. It seems that the GIMP developer has no plan to develop the mobile version of GIMP in the near future. Price is the key difference between Photoshop and GIMP. Photoshop is a paid tool while GIMP is released as a free software. The developer of GIMP adopts the donation model to keep the project going. Photoshop, on the other hand, requires users to be a paid subscriber to be able to use the tool. Adobe — the owner of Photoshop — is no longer accept one-time purchase as it used to be. Even so, subscription rule of Adobe is flexible enough. You can stop your subscription if you are not going to use Photoshop for some time and re-started at a later date. But still, credit card is required. 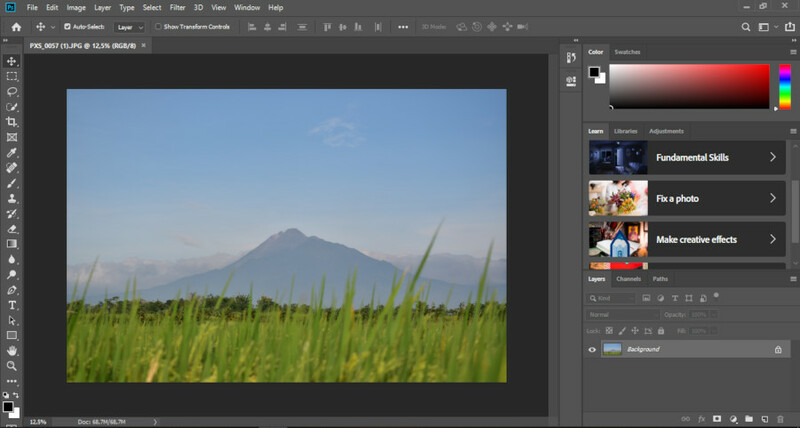 Adobe gives you a chance to use Photoshop for free for 7 days during the trial period. You can make use of the trial version of Photoshop to find out if this tool suit your need or not. Both Photoshop and GIMP are continuously developed. The key difference here is the party behind them. Photoshop is owned by a corporate (Adobe Inc) so it has a more unlimited fund for the development process. Photoshop, just like other Adobe products, has a huge team dedicated to giving you the best product possible. GIMP, on the other hand, is a community-driven project. This tool is create by a group of developers called The GIMP Development Team. Anyone who has a specialized skill can join to become a member of the group. Compared to Photoshop, GIMP has a slower development cycle. For example, the GIMP developer team didn’t make a big enough change for about 6 years until they released GIMP 2.10 in the middle 2018. Another key difference between Photoshop and GIMP is regarding the technical support. Photoshop offers great customer service. Customer service itself is another key difference between a proprietary and open source software regarding the software warranty. Nearly all open source developers, including GIMP, don’t offer any warranty about the product they develop. But, they typically have vibrant communities spread on the internet to help you solve certain technical issues. The biggest downside of GIMP is that it only supports RGB color profile. Well, you can actually convert your images in GIMP to CMYK. But, you can only do so via a separate plugin. Photoshop, on the other hand, supports both RGB and CMYK. You need to use CMYK instead of RGB if you want to print the image you are editing. RGB is only great for web use. Photoshop is a part of the Adobe Creative Cloud. Although you can use it as a standalone app, the use of this tool is not really separate with other products from Adobe. For instance, if you choose the Single App plan, you will get 100GB cloud storage capacity from Adobe, as well as premium features on Adobe Spark. Also, Photoshop is integrated with Camera RAW, allowing you to open RAW files without having to install additional tool. You can also directly share your works to Behance or import photos from Adobe Stock. GIMP, on the other hand, is very lack in terms of integration. There is no option to store your works to a cloud storage service. GIMP also has no built-in tool to handle RAW file. As mentioned above, you can open a RAW file in Photoshop without needing to install any additional tool or plugin. Photoshop has a built-in tool to handle a RAW file. You can open a RAW file in Photoshop just like when you open a JPEG or PSD files. The Camera RAW pop-up window will open once the RAW file is fully loaded. You can even make some adjustments before editing it using Photoshop. 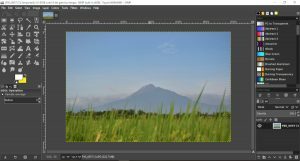 GIMP has no built-in tool to handle RAW files like Photoshop. It depends on other app to edit RAW file. At the time of writing, there is no tool yet that really integrated with GIMP like Camera RAW on Photoshop. RawTherapee offers an option to open a RAW file with GIMP. But, it is an standalone RAW editor. GIMP is built with photography in mind. In other words, this tool is more specified for image editing related to photography although you can also it for other needs. Conversely, Photoshop is not built specifically for photo editing. It covers aspects of designing, illustrating and even video editing. In Photoshop, there is a menu to set the interface according to the sort of the task you want to do. Whether editing photos, creating a 3D, painting and so on. That is why it takes longer to launch Photoshop than GIMP because Photoshop has more tools to be loaded. With fewer tools, GIMP consumes less resource than Photoshop. For instance, to open the same JPEG file with the size of 11 MB, Photoshop consumes about 700MB of RAM while GIMP consumes only about 200MB. 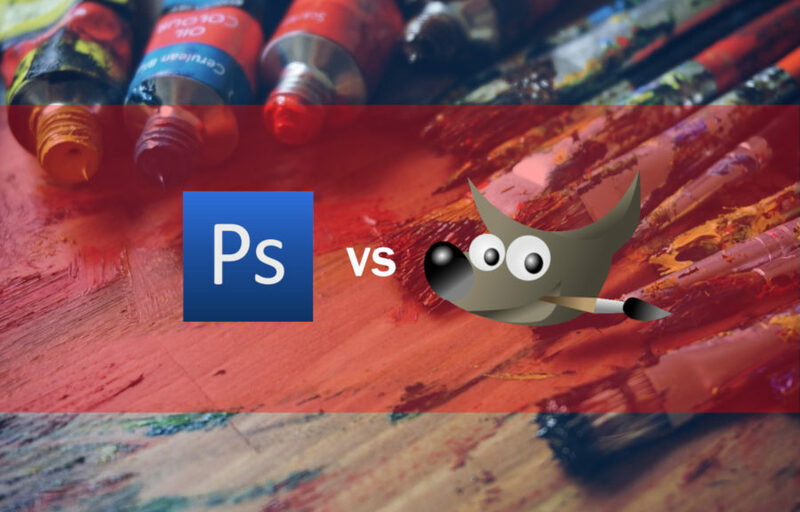 The user interface of Photoshop and GIMP are pretty similar. But, the interface of GIMP is more customisable. You are free to move and push away the unnecessary tools to simplify the GIMP interface. Since version 2.10, GIMP uses dark grey as the default theme, making it looks pretty similar to Photoshop. In GIMP, you can separate the toolbox in a different window. Something you can’t do in Photoshop. As mentioned above, Photoshop has a menu to set the interface according to the type of task you want to do. 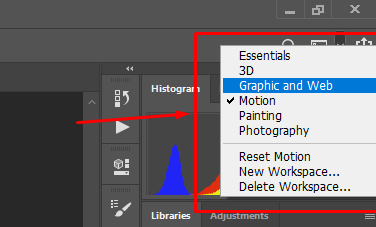 Each menu preset presents specified set of tools according to the task you want to do. GIMP is a suited tool if you are just a photography hobbyist who take photos only for fun, not commercial. You can’t use this tool for free without spending a dime. You can use GIMP as a photo retouching tool, manipulating photos, creating design and so on according to your speciality. If you are a professional photographer, Photoshop is still a better option. Especially if you want to sell printed photos since Photoshop supports CMYK and RGB while GIMP only supports RGB by default. Also, Photoshop is better for collaboration since it is cloud-based. There are some things that can only be done using Photoshop. Both Photoshop and GIMP are a great tools for editing photos or creating graphic design. The key difference between them is that Photoshop is a paid tool while GIMP is a free tool. GIMP is a great tool for a personal use although there is always a chance to use it for business. Photoshop has some advantages compared to GIMP. As a part of Adobe Creative Cloud, Photoshop offers plenty of integrations. You can instantly share your works to Behance or import photos from Adobe Stock. 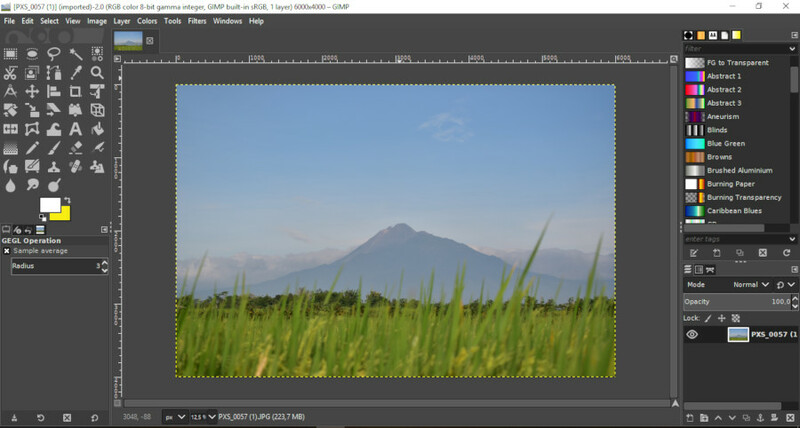 Photoshop also has a built-in tool to handle RAW file, while GIMP has no same tool. Photoshop has more tools than GIMP, but GIMP also supports plugins. Tools that are not immediately available on GIMP are possible via plugins. For a professional use, Photoshop is still better than GIMP. Photoshop supports CMYK, which is way better than RGB for a printing purpose. Photoshop is also better for a teamwork thanks to its cloud support.